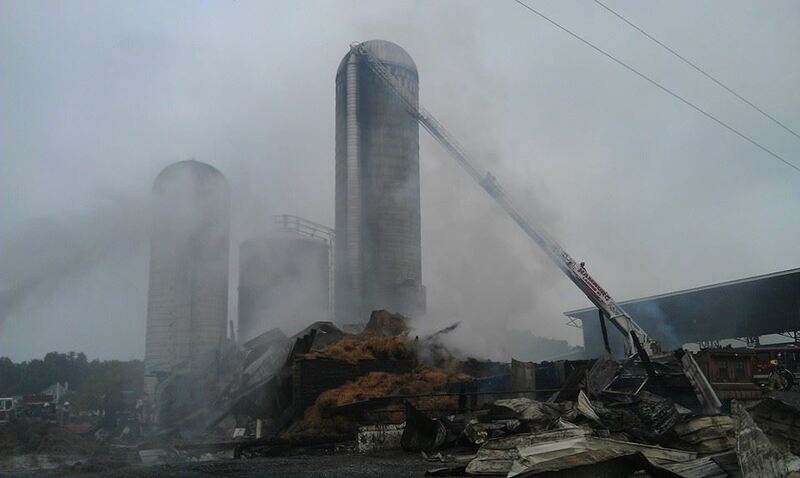 UNIVERSITY PARK, Pa. — A rash of barn and silo fires in the last week has an extension farm safety expert in Penn State’s College of Agricultural Sciences warning farmers to be aware of — and if necessary take precautions against — blazes caused by stored crops with high moisture content. This growing season was exceptionally wet, and related problems are beginning to show up with harvested crops, according to Davis Hill, senior extension associate in agricultural safety and health. He urges farmers to take some preventive steps to avoid serious consequences over the next few weeks. In stored hay, temperatures of 100-120 F are normal. At 120-130 degrees, a farmer should check the temperature daily. At 140 degrees, the producer should consider tearing down stacks and moving bales. At 150-160 degrees, the hay should be pulled out of storage with a fire department on the scene, Hill said, “because you may have bales ignite once they hit the air.” At 160-180 degrees, flare-ups and flash fires are probable when hot hay is exposed to air. And at more than 200 degrees, the fire department should be called and warned that a probable working barn fire is in progress. If you don’t have access to a thermal camera or other device that measures temperature, Hill recommends using a section of steel pipe as a gauge. Drive the pipe as deep into the hay pile as possible and leave it in place for 10 to 30 minutes. Remove the pipe with your bare hands. If the pipe is easily handled without feeling heat or discomfort, the hay in that area has not heated yet or is heating within normal range. If the pipe can be held only for a short time, the hay temperature is approaching 130 degrees, Hill said. If the pipe can be touched only briefly, hay temperatures are about 140-150 degrees. At 150 degrees, the pipe will be too hot to hold. If a pipe test suggests that stored hay is in the 130-plus-degree range, a farmer should contact a local fire company for assistance. Silage and silos present an entirely different problem, Hill explained. As opposed to hay that will combust spontaneously because it is too wet, silage will combust spontaneously when it is too dry. Under ideal conditions, silage heats up during the fermentation process, and it’s the moisture in the silage that draws the heat away. With less moisture, the heat will continue to rise until the silage mass begins to smolder. When new material is put on top of old silage, the heat generated from the new material during its fermentation will draw into the older, dry material it is piled upon. To illustrate this phenomenon, Hill cited a recent phone call he received about a silo that was on fire. It had fresh hay silage on top of older material. With a wet-weather forecast, the farmer had decided to put the hay into the silo because it contained too much moisture for dry hay. The older silage had not been disturbed by unloading for several weeks. “This farmer reported smelling something burning the week before but assumed it was a neighbor’s property because he saw no smoke and only occasionally caught brief ‘wiffs’ of burning odor,” he said. “By the time he saw smoke and summoned the fire department, firefighters saw flames on the silage surface, two burned-out silo doors and excessive heat coming from the top of the silo. Silo fires are tricky to manage, Hill said. If you can get to them early, there’s a decent chance of a successful extinguishment, but monitoring a silo for a possible fire is not easy. A farmer needs to use his sense of smell because a fire in a silo can smolder for weeks before it is discovered. Hill stressed that producers should not go into a silo for two to three weeks after filling because of the buildup of carbon dioxide and possibly toxic silo gas, so taking temperature readings is not possible. “One could climb the exterior of the silo and view the interior from the filling platform, but this really won’t show you much,” he said. For more information contact Davis Hill at 814-865-2808 or by email at deh27@psu.edu.